This knowledge is laced with fun. For kids, fun usually involves special affects. BoBo the robot and this app gladly provides the kind of specials effects that make the iPad such a transcendent educational too. Touch his antenna? Something fun will. Maybe sadly, my kids love being able to strike BoBo with lightening. Some of the content is a little complex. Even I could not follow the proton/neutron explanation at one point because it went too far beyond my positive/negative knowledge base. But even if your kids are too young to fully understand, they get introduction to concepts that they are certainly going to see again down the road. 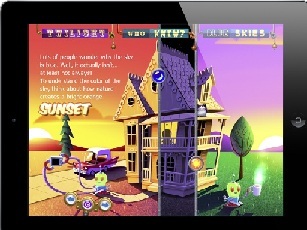 The price of BoBo Explores Light is on the high side: $6.99. But, honestly, after playing with BoBo for a week, we would have paid $69.99.